An exhaustive guide to the management, suppression, and ecological significance of forest fires. Debut author Gboloo begins the first installment in his four volume series by outlining the destructiveness of global warming as attested by the most recent scientific findings. The link between climate change and forest fires is important: hotter temperatures can contribute to more fires, and the forests play a crucial role in rejuvenating ecologically embattled microclimates and absorbing carbon dioxide. Also, the devastation wrought by forest fires is considerable, measurable in the loss not only of trees, but economic resources and human life. Moreover, more than 80 percent of the world’s woodlands are vulnerable to fires. In some countries that lack of preparedness is a function of poverty, but in others, it’s the result of ignorance regarding forest-fire management. 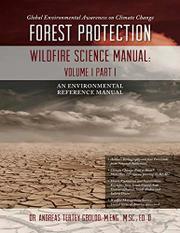 The author covers an extraordinary array of topics, including strategies for the prevention and suppression of wildfires, the causes of desertification, the salaries of fire wardens, and campfire safety. There is also a discussion of the evolution of forest-management theory in the United States as well as a study of the kinds of tree species that are the most fire resistant (paloverde, Chilean mesquite, willow acacia). The study uses charts, graphs, and photographs to illustrate the author’s points and opens with four forewords from prominent professionals from the forestry- and emergency-management industries. Gboloo’s knowledge of the subject is impressively encyclopedic—at one point, he provides an analysis of the management resources used in the most fire-prone states. Wildfire management is a multidisciplinary affair, and the author expertly discusses the scientific, ecological, and economic components of it. The prose, however, is both congested and meandering, and paragraphlong sentences defy easy interpretation. Also, the writing is almost mechanically academic and plodding: “Academic institutions are the champions on knowledge acquisition and application by graduating students who leave and apply their knowledge on the field.” This still remains a valuable resource for forestry professionals. A remarkably comprehensive manual written, unfortunately, in turgid prose.